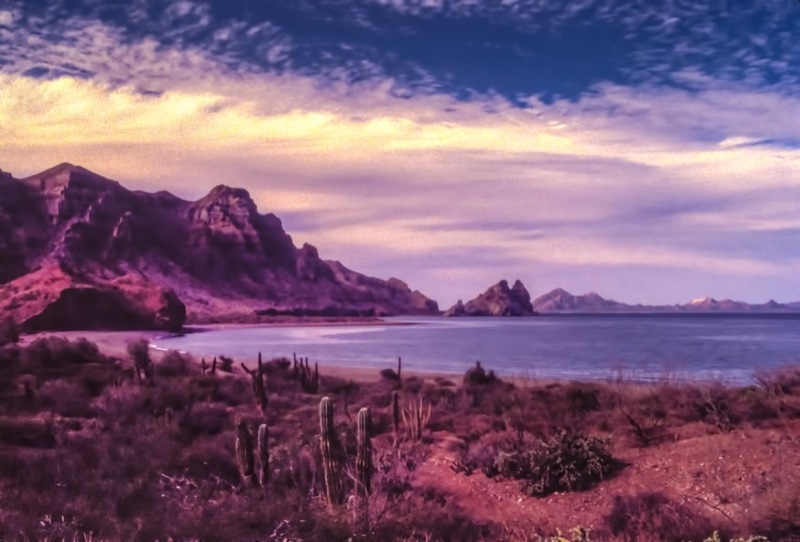 Baja California, Mexico, somewhere between Loreto and Puerto Aqua Verde, Mexico. I did post this a while back, but have done quite a bit to this photo since then. This is one of those photos that I really liked, but could never get it to look like it did when I was there. (Believe me, it looked a bit different than this in real life). There is no easy way to get to a place like this, especially overland. If there is a road anywhere nearby, it is likely unpaved. Worse, it may be a one lane road without guardrails, winding through steep hills. On the rare likelihood you encounter someone else on the road going in the opposite direction, one of you had better be pretty good at driving backwards until you reach an area wide enough for two vehicles. The group I was with took an easier way. We arrived at this point after about four hours of paddling a kayak. A power boat would have been easier, but that was not the purpose of this trip. This photo was processed with a painted effect.